A seamless laundry experience that is definitely not an item transport mod. Hang your stuff on a clothesline to dry! Build a vast network of clotheslines and roll it around with a crank to maximize exposure to sunlight! Automate your laundry! Clothesline Anchors: Place them anywhere on the ground, the wall or even the ceiling. Clotheslines: Craft them with Wool and a Spinner. Hang them between Clothesline Anchors. Attach clothes to leave them to dry. Cranks: Attach on a Clothesline Anchor and spin to send your clothes flying! Hopper interaction (temporary): Use hoppers with Clothesline Anchors to automatically attach and detach items on Clotheslines. Advanced automation of attachment and detachment of items on Clotheslines. 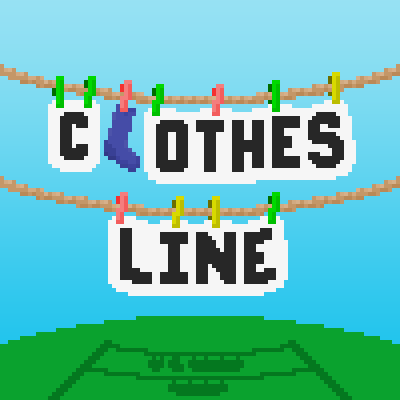 Looking for the Fabric version of Clothesline? Wow, this looks like what I've been looking for. Awesome mod! Think you can take a day and update Literal Ascension? You better be adding a white shirt with the name "Jamie" on it. Great mod by the way. Really fun and simple. Thank you. How else are we going to know it's his mod? Simple and beautiful, simply perfect. A integration with Bettter With Mods would be superb! I find this mod amazing, the models, animations, aesthetics and the textures are all just amazing. Honestly this is probably the best mod I've seen all week and I think this mod should be in vanilla minecraft because it's that good. maybe (just a thought) it could be used as a drying rack as well, like in tinkers construct? Like adding an mechanical crank which can be powered by Water, Wind or maybe FE. More Hopper interactions like the ability to take stuff off again. I can imagine item transport with this very good and it looks amazing. It could even be turned into a player transport mod by adding attachable chairlifts or even cable cars. I'm seriously hoping this isn't just a one-off mod and it gets expanded eventually. Would be cool. Would definitely want hooks into Mystical Mechanics/Better With Mods/etc axle systems 'cause I don't really think we need yet another standalone one. If it doesn't have such hooks then ideally it'd just be redstone powered with the strength of the redstone determining the speed of the clothesline. If/when this gets finished or more updated then I'll probably be using it solely for item transportation in my pack, probably removing Thermal Dynamics. I don't see that being the direction the mod is going in. Please do more with it, looks amazing.. I'm liking this mod, but due to the Youtube downtime I had an issue trying to figure out how to set up the lines without the video. I didn't know I had to hold down the Right Mouse button to create lines. Which makes me wonder, how many lines can be supported by an anchor at the same time? Is it 2, or can they potentially branch ouff? I love this, but cant wait for the auto crank. Looks great! Can't wait for automation! A, this is incredibly well-done looking.